Topic: [RESOLVED] SimConnect, which ones? 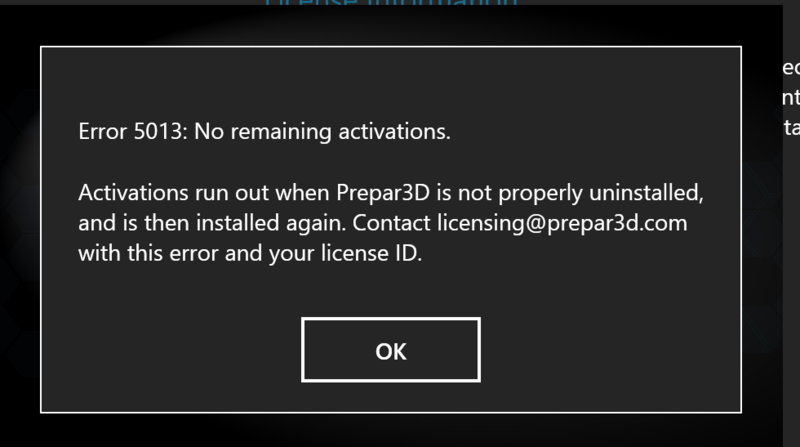 My PC crashed so I had to reinstall Windows and P3D. So I was on 4.3 and installed 4.4. When I ran it I get a box telling me I have an activation issue and to contact LM. Here's the screen I get. Thanks, I've tried this and it behaves the same way, it still hangs. Topic: [RESOLVED] Again, settings not saving. Re: Again, settings not saving. Oh, ok, thanks then Kayla. [RESOLVED] Again, settings not saving. Topic: Auto-throttle disengage key command? Re: Auto-throttle disengage key command? Thank you! I can assign a key but then with Saitek's SSI I can assign a button to that key. I don't use FSIUPC so it's good. Thanks Elaine, I'll get it and have a look. Most grateful!